When eccentric novelist Robert Eady abruptly vanishes, he leaves behind A missing person, a grieving family, a curious clue: a half-finished manuscript set in Paris. Heading off in search of its author, a mother and her daughters find themselves in France, rescuing a failing bookstore and drawing closer to unexpected truths. To ask other readers questions about Paris by the Book, please sign up. At some point in our lives, we have watched a show, attended a concert or read a book and ultimately said, "we'' there's an evening that I won't get back." Expectation was high, but the reality of the experience was not even close. Disappointment, some feeling of disbelief, and a little anger of time wasted are the initial feelings. I will usually try and rationalize and reason it out and think about what maybe I missed or what the creators goal was but sometimes you have to accept reality that i At some point in our lives, we have watched a show, attended a concert or read a book and ultimately said, "we'' there's an evening that I won't get back." Expectation was high, but the reality of the experience was not even close. Disappointment, some feeling of disbelief, and a little anger of time wasted are the initial feelings. I will usually try and rationalize and reason it out and think about what maybe I missed or what the creators goal was but sometimes you have to accept reality that it wasn't that good. I wish I could've walked away from Liam Callanan's book, Paris by the Book, but no matter how long, slow and boring the might be, I will prevail to the end. Part is a hope that the tide will turn as I flip the next page and suddenly the book will be the one that I lose sleep over staying up late to finish with that "Oh or Aha" moment. Unfortunately Callanan's book never gained momentum and was a long hard journey to the finish line. The fictional story of writer, husband, father, Robert Eady, whose disappearance leads his wife, Leah, and their children, Ellie and Daphne, on a search to find him. Sounds like the makings of a good book as the family uproots their lives in Wisconsin to the city of lights, Paris, France in hopes of finding him. Unfortunately, Paris, a mystery and even a beautiful red bookstore couldn't bring this story to life. There is a lack of continuity in regards to the overall plot along with weak and unlikable characters. Ultimately I found myself disinterested in the characters and the story. I loved the cover of this book with its bright red cover but as the saying goes, "don't judge a book by it's cover." Leah and Robert were College sweethearts, always wanting to go to Paris, France, settling for trips to Paris, Wisconsin, and other cities and towns named Paris thinking, maybe one day. Robert is a writer - he craves time alone and often takes off, he and Leah and his kids, Ellie and Daphne, have an understanding. When Robert needs time, he just leaves, always leaving a note, saying “be back soon.” Sometimes he’s gone for hours, sometimes days, never providing an explanation. One morning, 3 Stars. Robert is a writer - he craves time alone and often takes off, he and Leah and his kids, Ellie and Daphne, have an understanding. When Robert needs time, he just leaves, always leaving a note, saying “be back soon.” Sometimes he’s gone for hours, sometimes days, never providing an explanation. One morning, Robert leaves and doesn’t come back. At first, Leah and her girls think he simply took a trip and then, as the days go by, they think he abandoned them or worse. When Leah finds a confirmation code in a cereal box for 4 plane tickets to Paris, France, leaving in a few weeks time, Leah knows - she and the girls must go. Maybe, just maybe… Paris is like a dream for all of them, being able to let go, find each other, and get help. Once they receive a half finished a manuscript of Robert’s, however, Leah, Ellie and Daphne have more questions than answers and can’t help wonder if maybe Robert is alive. “Paris by the Book” is a slow moving domestic drama about a family whose lives have been torn apart. There were times when I was deeply involved in the storyline and enraged at the character of Robert, who took off for days at a time with no explanation and seemed to have little regard for his family and at the character of Leah, who often cared more for her own regard than her daughters. Unfortunately, in my opinion, this novel included a bit more of a tell vs. show style of writing and had a tendency to overuse the phrases “I said” and “Ellie said” etc., which I admittedly grew a little tired of. The characters of Leah, Daphne and Ellie however, all had me fully invested in the storyline which made me eagerly await the outcome. This was a sister read with Lindsay - thanks for reading this one with me Linds! Sorry it took me a little while to finish! Thank you to Edelweiss, Penguin Publishing Group and Liam Callanan for an ARC of this novel in exchange for an honest review. Published on Edelweiss and Goodreads on 6.3.18. DNF When writer Robert Eady disappears, his wife, Leah, and daughters, Ellie and Daphne, don’t know if he’s alive or dead. I did want to find out the mystery of what happened to him, but unfortunately, the writing style made me not care enough to actually finish this book. Leah’s narration is incredibly odd. She’ll skim over months and months. Events will abruptly happen. There is just no continuity in the narrative, and it bugged the heck out of me. Leah and her daughters go to Paris to find cl DNF When writer Robert Eady disappears, his wife, Leah, and daughters, Ellie and Daphne, don’t know if he’s alive or dead. I did want to find out the mystery of what happened to him, but unfortunately, the writing style made me not care enough to actually finish this book. Leah’s narration is incredibly odd. She’ll skim over months and months. Events will abruptly happen. There is just no continuity in the narrative, and it bugged the heck out of me. Leah and her daughters go to Paris to find clues about what happened to Robert, and Paris is a city I love. Still, even the wonderful setting wasn’t enough for me to get passed the 30 percent mark in this novel. Thanks so much to NetGalley for the opportunity to review this novel. I really wanted to love this book, this writer is from my hometown and the Milwaukee bookshop he references is also close to me. I would classify this more as women’s fiction than anything else as the mystery is slow moving and is only part of the story. Leah and Robert Eady had what started out as a good marriage with bright prospects for the future. They have two daughters, Daphne and Ellie, now young teens, and both parents are quite involved with the girls. Robert is a writer who had one best I really wanted to love this book, this writer is from my hometown and the Milwaukee bookshop he references is also close to me. I would classify this more as women’s fiction than anything else as the mystery is slow moving and is only part of the story. Leah and Robert Eady had what started out as a good marriage with bright prospects for the future. They have two daughters, Daphne and Ellie, now young teens, and both parents are quite involved with the girls. Robert is a writer who had one bestseller but has been struggling for years to produce another. He goes on what he calls “write aways” which start to become longer and longer periods of time away from home. Leah is starting to have less and less patience with him and his habit of leaving short notes or clues as to where he is going. It soon becomes apparent that the marriage is headed for trouble and finally Robert disappears for what seems like forever. After the police and others have searched and searched for Robert, Leah finally finds a clue in a cereal box which leads to finding tickets for them all to go to Paris. With the family somewhat in shambles Leah decides to uproot the family, go to Paris and eventually stay. She becomes the owner of a bookstore, not unlike the one described in an unfinished manuscript of Robert’s which comes to surface. We are witness to the struggles that Leah and the girls have in Paris. At first it is difficult but the girls in particular seem to take to the city, the language, the whole different feeling that they are experiencing from their life in Milwaukee, youth usually acclimate quicker than adults in my experience. Both Leah and Robert are obsessed with the “Madeline” series of children’s books as well as a film called “The Red Balloon”. I am familiar with the books but not the film. Problems I had with the book. I found the plot very slow moving and somewhat choppy with references back and force from past to present that did not flow well. The continued references to the Madeline books and The Red Balloon became tiresome and felt overdone. I didn’t really feel a close connection to Leah, I enjoyed the point of views from the girls more interesting and caring. This is a good story, particularly if you love Paris, which unfortunately I’ve never visited. The writing is good but as I mentioned slow moving, it took me several days to get through it because I kept putting it down. At 70% I started to enjoy the novel more as things finally started happening and the last quarter of the book is probably my favorite. I received an ARC of this book from the publisher through NetGalley, thank you. I guess I'm a sucker for anything about bookstores and Paris. Can I buy a bookstore and live in Paris too? There's a compelling story here about a disappeared writer father and how his family follows clues to Paris to search for him. I see that some other reviewers were disappointed by the ending, but I thought it fit the story just right. There's a back and forth to the first part of the book, where the action flashes between Milwaukee family life before the writer's disappearance and then thei I guess I'm a sucker for anything about bookstores and Paris. Can I buy a bookstore and live in Paris too? There's a compelling story here about a disappeared writer father and how his family follows clues to Paris to search for him. I see that some other reviewers were disappointed by the ending, but I thought it fit the story just right. There's a back and forth to the first part of the book, where the action flashes between Milwaukee family life before the writer's disappearance and then their life in Paris searching for him. The mystery of what happened to the writer and where did he go was enough to keep me hooked, but mostly I just wanted things to be in Paris because I thought the very-American descriptions of Paris and of learning to join Parisian life were great and usually very funny too. Also, I've had to read way too much Madeline to my kid in the last year, and I loved how this book constantly engages Madeline and the Red Balloon to think through the effects of those books and the places that we imagine from classic kid literature. This was a story of family. A broken family searching to piece itself back together. One day Leah’s husband Robert, an eccentric novelist, vanishes. His absence leaves Leah and their two teenage daughters, Ellie and Daphne, alone and confused. In their search for Robert, mother and daughters, ‘temporarily’ move to Paris to continue exploring the possibilities of where he may be. Through hidden notes, hand written clues in books, a secret manuscript and mysterious ‘sightings’, the three 3.5 stars. One day Leah’s husband Robert, an eccentric novelist, vanishes. His absence leaves Leah and their two teenage daughters, Ellie and Daphne, alone and confused. In their search for Robert, mother and daughters, ‘temporarily’ move to Paris to continue exploring the possibilities of where he may be. Through hidden notes, hand written clues in books, a secret manuscript and mysterious ‘sightings’, the three women try to find their way back to becoming a family. While parts of this novel felt slow and somewhat repetitive, looking back, it seems as though that may have been intentional. These women find themselves in a long, drawn out search to find answers and my journey, as the reader, felt similar (and not in a bad way). Upon finishing this novel, I look back and feel that my experience was a direct reflection of what the characters were going through. Quite simply, I felt a connection to these characters and their search. The author, Liam Callanan, has a unique writing style. It took me more than a few pages to get into it, but once I did, I really connected with it. There were several sentences that made me stop and reread because the wording was just so good. This is a novel is about coping with loss and taking a leap of faith by following a dream. Leah is devastated after her husband's disappearance. Soon after, Leah takes her daughters for a visit to Paris and ends up staying and managing a bookstore. The premise sounds wonderful but I did not enjoy this novel as much as I expected. The main character goes on and on about The Red Balloon movie (and the book) and also about the Madeline's children's stories. After extensively describing them she ret This is a novel is about coping with loss and taking a leap of faith by following a dream. The premise sounds wonderful but I did not enjoy this novel as much as I expected. The main character goes on and on about The Red Balloon movie (and the book) and also about the Madeline's children's stories. After extensively describing them she returns again to it several times in the book. Also, the pace is very slow. I had expectations this novel would have some mystery to it, and it does but I think the novel can be better categorized as women's fiction. After reading over 51% of it I found myself skimming some sections. I finished it expecting the pace would pick up later on but it didn't. Overall, it was ok. As much as I love reading about Paris and bookstores the story could not hold my interest. 2.5 rounded up. A touching story of a family consumed by a mysterious disappearance that launches them on a literary journey in the City of Light. They met outside a bookstore in Wisconsin! Leah, a former film student, whose favorite film was The Red Balloon by Albert Lamorisse and Robert, a struggling author, loved the Madeline books by Ludwig Bemelmans. The two continued to debate about which was better, even after they got married and had children of their own, two little girls. Both works are set in Paris, and Leah and Robert’s ultimate dream was to go to Paris, but there was never enough money. And then one day Robert went out for a run and totally disappeared. No one could find any trace of him, or knew whether he was dead or alive. Leah and the girls, Daphne, 14, and Ellie, 12, were devastated, confused and inconsolable. They don’t want to believe that he is dead, but they also can’t believe he would leave them for good. Perhaps it was time to go to Paris, maybe Robert was there. There are clues pointed in that direction, particularly a half finished manuscript about a family in Paris. Once they are there, it’s not long before they are living above and running a failing bookstore...and believe they are seeing Robert everywhere. Paris by the Book is the story of a woman whose life has been usurped by her husband’s disappearance. Leah’s character is well developed and you can easily understand her struggle of not knowing if he is dead or alive. The mystery of Robert’s disappearance most definitively propels the narrative. Parts of the story are brilliant and fun, while a few parts are confusing and slow. Leah’s thoughts frequently are wandering here and there, pondering the past, struggling with the present and worried about the future. But who can blame her, given the situation. Book People and Paris lovers should appreciate this story. Not being familiar with The Red Balloon film, the book motivated me to watch it one afternoon. Very interesting! Liam Callanan is an American author and professor of English at the University of Wisconsin in Milwaukee, his other novels include Cloud Atlas and All Saints. Thanks to Penguin for an advance reading copy of this book in exchange for an honest review. Is Leah a widow? For almost a year, she is unsure. Her husband, Robert, vanishes and I don’t say suddenly, because it is like him to take a break from the family from time to time: this time, he doesn’t leave a note and does not return. Is he leaving her clues to his whereabouts? Conflicted with her emotions, Leah and her daughters, Ellie and Daphne, take a trip to Paris in hopes of finding their father; if he is still alive. The book does have a slow start, but I felt a need to discover what happened to Robert and kept on reading. About midway through the pace picked up a bit more and I felt more connected to Leah, Ellie, and Daphne. It is a story about grief and how one’s grief journey is never the same as another, and the need for family to understand each other is essential in moving forward (or to stay in one’s preferred place until ready to move forward). The need to listen, and how often listening is avoided in order to protect one’s own emotions. You are experiencing Leah, Ellie, and Daphne’s journey and will find that you silently fight for them: for their protection. This is not a read that you pick up if you are looking to brighten your mood. But, its a read that makes you think “what would you do in this position?” The concept was unique and I was not left disappointed when I finished. The ending suited the story. I would rate this book a 3.5 out of 5. I liked it, but its one that you have to be in a certain mood to read, and need a bit of patience to read through the slower first half. The story could have been condensed by half, because halfway through I no longer cared whether the missing husband/father ever turned up. This should have been a book I adored! And from the blurb I thought I was going to be in for an incredible journey following a family who are beset by a disappearing husband, and their quest to trace him, whereever that may have been. But for some reason I just found myself not connecting with the wife and daughters, as they moved to Paris where they opened up a bookshop and keep thinking that they spot the missing Robert, and is it him leaving messages in odd places? The story wasn't whimsical This should have been a book I adored! And from the blurb I thought I was going to be in for an incredible journey following a family who are beset by a disappearing husband, and their quest to trace him, whereever that may have been. But for some reason I just found myself not connecting with the wife and daughters, as they moved to Paris where they opened up a bookshop and keep thinking that they spot the missing Robert, and is it him leaving messages in odd places? The story wasn't whimsical or emotional, and at times just felt a bit messy as the story wandered all over the place. I found this book enchanting. It draws the reader in and keeps them off balance with the protagonist as she negotiates her new normal. It represents Paris through a variety of literary filters and adds its own spin. I enjoyed the settings, the characters and the way it did not take the easy way out. Liam Callanan’s novel is a charming yet mysterious story about Leah and Robert Eady. The couple have two daughters, Daphne and Ellie and the family appears to have a relatively happy life until Robert, a novelist, disappears. Leah finds a clue that leads her to Paris in search of Robert. The Eadys have their own little obsessions with Paris. Leah loves the film The Red Balloon and Robert likes the Madeline series of books by Ludwig Bemelman. Leah and the girls move into an apartment atop a failing bookshop. Callanan’s details of this little corner of France pulled me in: the food, the books, the streets. Paris by the Book is a love story and a mystery. The meeting of Leah and Robert was one of my favorite parts of the novel. Leah and her daughters experience the loss that comes with the disappearance of a loved one. My issue with the book was the repeated references to the The Red Balloon and Madeline which I thought were a bit overdone. Not having seen the film, I wondered if I was missing something in parts of the book. Overall, the book is a nice read that left me longing to visit a bookshop and Paris. I read this family drama/broken marriage thriller/book-for-book-lovers all nearly all the way through, hoping it would decide what kind of narrative it was so I could connect with it...but no luck. There are moments of good writing, interesting plot lines, and promising character development, and then it lapses back into jumbled time tables, endless, repetitive descriptions of the narrator’s emotions, and cliff-hanger chapter endings that end up not that interesting. This book is not what its cove I read this family drama/broken marriage thriller/book-for-book-lovers all nearly all the way through, hoping it would decide what kind of narrative it was so I could connect with it...but no luck. The narrator's voice lacked authenticity - it read like a man writing a book trying to sound like a woman - and the writing was at times clunky and annoying. I totally concur with previous reviewers who said they came to this book expecting to be charmed but ended up very disappointed. As with so many of them, I am, obviously, a book lover, an also someone madly in love with Paris. I'm glad there are readers here on Goodreads who loved this book, but, sadly, I'm not one of them and really don't The narrator's voice lacked authenticity - it read like a man writing a book trying to sound like a woman - and the writing was at times clunky and annoying. I totally concur with previous reviewers who said they came to this book expecting to be charmed but ended up very disappointed. As with so many of them, I am, obviously, a book lover, an also someone madly in love with Paris. I'm glad there are readers here on Goodreads who loved this book, but, sadly, I'm not one of them and really don't know anybody I would recommend it to. I was worried this was going to be a disappointment after reading a bunch of mediocre reviews, but it was great! I think a lot of people were probably expecting a lighter read from the description, but this is a really a book about grief, & imagination, & uncertainty, & love & loss. It's about the touchstones of our childhood & how they change as we change, about living as creative people in a world that rarely rewards or accommodates that, about making big sudden changes whe I was worried this was going to be a disappointment after reading a bunch of mediocre reviews, but it was great! I think a lot of people were probably expecting a lighter read from the description, but this is a really a book about grief, & imagination, & uncertainty, & love & loss. It's about the touchstones of our childhood & how they change as we change, about living as creative people in a world that rarely rewards or accommodates that, about making big sudden changes when you're stuck, & sometimes not knowing whether those changes or your imagination are indeed saving you or just keeping you mired where you're stuck. Maybe both. Maybe you won't know until later. Much later. Maybe it depends on what you do with them. It definitely helped that I loved the Madeline books as a kid & had seen The Red Balloon (too many times, in school assemblies when the weather was too bad to go out for recess. I understand even less now how that was thought a film for children.) But even if I hadn't, I think I would've appreciated those sections and how the narrator kept coming back to both. Each time she revisited them, the changes in her perspective tracked her internal changes and development, which were crucial to the story. The mystery here for me ended up reading less as a mystery about whether her husband was still alive, in a typical find-out-what-happened kind of way. It was more about the narrator and her daughters -- whether they were seeing potential signs he was alive because they still wanted him to be. Was it magical thinking, as they each lived their grief, separately & together? Or were they picking up on things no one else noticed because they knew him so well & loved him so much? As another reviewer said, I also appreciated that the author didn't take an easy way out with the end. There were a lot of interwoven threads through this story that were all at least provisionally resolved, but very much not neatly wrapped up. If anything, the book seemed to consciously leave us wondering about another mystery -- was this based on or inspired by episodes in the author's own life? As much as I wanted to enjoy (and did, at times) this novel, I can only suppose it's a demonstration of how perfectly terrible people can treat each other in the name of 'art'. I grabbed this one off the library bookshelf in about half a second: a book about a Paris bookstore? Absolutely I'll read this. First, I thought Mr. Callahan did a great job writing from the POV of a woman: any good author should be able to switch POVs from male to female and back. I found the following great: "In France, As much as I wanted to enjoy (and did, at times) this novel, I can only suppose it's a demonstration of how perfectly terrible people can treat each other in the name of 'art'. I'm giving up on Paris By the Book. I can't stand Leah...is that her name?...she complains about her husband not taking her to the real Paris, then complains about going to Paris, complains about being in Paris and then complains about staying in Paris. All this complaining after spending years dreaming of going to Paris. Seriously. I want to slap her. Even if I hadn't been to Paris recently and just experienced my own dream trip, I think I would still want to slap her. SHE'S IN PARIS. HER DREAM I'm giving up on Paris By the Book. I can't stand Leah...is that her name?...she complains about her husband not taking her to the real Paris, then complains about going to Paris, complains about being in Paris and then complains about staying in Paris. All this complaining after spending years dreaming of going to Paris. Seriously. I want to slap her. Even if I hadn't been to Paris recently and just experienced my own dream trip, I think I would still want to slap her. SHE'S IN PARIS. HER DREAM TRIP. QUIT COMPLAINING. This review has been hidden because it contains spoilers. To view it, click here. I take back my comparison of this book to what happened to my grandmother in the mid-1920s. My grandfather ran off with another woman. This story is very like what happened to a family I know when the father went missing after a recurrence of PTSD after escaping the WTC on 9/11. This is a very sad story but I cannot imagine that the emotions experienced by the narrator would be those actually experienced by an abandoned wife. While I appreciated the story, I fear it lacks truth. First there is the title: What an enticement! Paris and books; I GOTTA read this novel. Then there is the synopsis: An eccentric novelist who has gone missing. His grieving family. A bookstore. An unfinished manuscript by said missing novelist. I was already anticipating how wonderful this book would be. Then there is the first sentence: “Once a week, I chase men who are not my husband.” I can’t wait to get my hands on a copy of this novel. Leah steals a copy of “The Red Balloon First there is the title: What an enticement! Paris and books; I GOTTA read this novel. Leah steals a copy of “The Red Balloon” from a Milwaukee book store. Robert sees, follows and confronts her. That’s how they met. The encounter sets up a sweet romance between the two who eventually get married and have two daughters. Leah and her daughter don’t think much about it when their Robert turns up missing. He does that a lot. When he gets stuck in his work, he goes on writeaways. He always leaves a note. But this time there is no note. Still, they shrug it off as sometimes the notes are left in the strangest places. Months pass, and the family goes about its daily life. Clues begin to surface in the strangest of places. One clue was six capital letters inside Robert’s favorite box of cereal. Quickly deciphering the code, Leah and her daughters head to France in search of Robert. Looking for a place to stay, they stumble upon a small bookstore, whose owner is eager to sell. Leah buys it and the family starts to settle in with an eccentric cast of supporting characters. Leah discovers one of Robert’s books on the shelves and places it in the store window. The girls are convinced that they catch glimpses of their father in various Paris locales, but Leah is convinced he is dead. When someone want to buy the book in the window, Leah discovers an “I’m sorry,” written on the inside cover. Who but Robert could have written that, and if did come into the shop, why didn’t he stay? There are so many questions with no answers. Then a manuscript by Robert turns up. It’s like he’s been watching them, writing as their lives unfold. This part of the novel was rather hazy for me. The story was interesting and I did enjoy it, but it moves rather slowly. Therefore, “Paris by the Book” receives 3 out of 5 stars in Julie’s world. 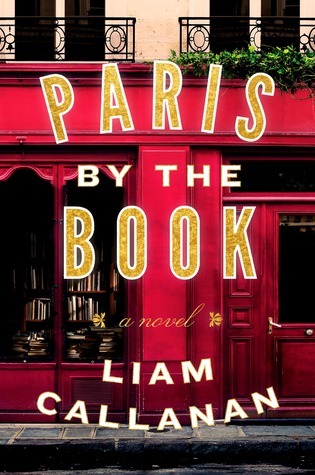 ​Definitely a slow-burner, PARIS BY THE BOOK by Liam Callanan is a quirky and unusual read that definitely fits into the contemporary/women's fiction genre better than mystery or thriller. At times I found the book a little tough to get into but as I became surrounded by the essence of Paris, it soon became easier, and the later parts of the book are quite captivating. ​PARIS BY THE BOOK has unusual characters that aren't always likeable but they are compelling in their own right and this story has something that makes you need to know what really happened. When Leah's husband goes missing it isn't exactly worrying, he does go off a lot to write and always comes back. This time he hasn't left a note, this time he hasn't come back, Leah and her two daughter's are trying to come to terms with it, why has he gone, where has he gone and why hasn't he come home? They find themselves in Paris, looking for Robert, making a new life for themselves both working in a book shop and looking after two young twins. The girls are adjusting to life in Paris, learning the language, constantly looking for their dad. Leah follows men who could be her husband, she sees him constantly whilst trying to come to terms with the fact he may actually be gone for good this time. I have flipped back and forth on this book, 2.5 stars or 3 stars. I loved the location, once they get to Paris, Callanan describes the city so well I was actually there. The language, the social interactions, the etiquette, the buildings, the feeling of walking down the streets, it really made me want to visit again, this time as an adult. The story itself, I read it as a woman's husband has disappeared so the book focus is going to be on that, tracking him and a whole big mystery. Whilst yes the husband aspect is addressed it isn't, for me, the bulk of the story. That was taken with Leah's personal journey, the courage to try and find out what happened, re locating, assessing her own self, her parenting, her relationship with her girls, analysing her relationship and what it was like with her husband. Therefore for me it was more of a personal journey, self exploration for Leah and the husband disappearance, whilst it kicked it all off, that took a back seat. That doesn't make it a bad story, not at all but it is one of the reasons I don't always read the blurbs now as I think you go in with a pre conceived idea and expectations of what the book will be which can hamper your enjoyment of the book. This is on me as a reader and not the author but it does hugely impact how I get on with the book. My other issue was it jumps around an awful lot so I had to go over pages to make sure where the character was and what was happening. The timeline goes from present day, then flips back to a memory of say her and her husband either living together or pre marriage or how they came to be then back to current happenings. Then there are references to the books that brought Leah and Robert together, they both love works by two different authors and Leah talks about one that was made into a movie. How it impacted on her, how it brought her and Robert together and it did pique my interest into them which I love when a book does that. I am not sure if there was an undercurrent to the book that just went over my head that maybe other readers may well appreciate. This book is one of the strangest that I read it in 2018. I picked it up because the book cover, and to read it because of the previous book I read about a bookshop in the U.K. I picked up the book because of the mystery. This books had strange family-relationship, and the writing was weird. I continued this book while listening to the audiobook, thank God that the narrator was interesting. I could finish the book as well as read the French phrases without a problem. This book was not my cup of te This book is one of the strangest that I read it in 2018. I picked it up because the book cover, and to read it because of the previous book I read about a bookshop in the U.K. I picked up the book because of the mystery. This books had strange family-relationship, and the writing was weird. This book was not my cup of tea, and that is the reason I gave it 2-stars. It has everything I love...books, relationships, Paris...and I liked it, but I didn't love it. That's really all I can say without telling you too much about the story. I'm glad I read it. I'm just sad the plot didn't move in the direction that I like. Liam is the author of The Cloud Atlas (Delacorte, 2004; Dial, 2005), All Saints (Delacorte, 2007; Dial, 2008), Listen (Four Way, 2015) and the upcoming Paris by the Book (Dutton, 2018). He serves in the English department of the University of Wisconsin-Milwaukee, and was previously its chair, as well as coordinator of its Ph.D. program in creative writing. He has regularly contributed to local and Liam is the author of The Cloud Atlas (Delacorte, 2004; Dial, 2005), All Saints (Delacorte, 2007; Dial, 2008), Listen (Four Way, 2015) and the upcoming Paris by the Book (Dutton, 2018). He serves in the English department of the University of Wisconsin-Milwaukee, and was previously its chair, as well as coordinator of its Ph.D. program in creative writing. He has regularly contributed to local and national public radio, and is possibly the only person now living (but consult your own Venn diagram) who has written for all of the following: the Wall Street Journal (on zeppelins, jetpacks, and touring Paris and Greece with children's books), The Awl, Medium, Commonweal, Esquire.com (on swimming and flying), Slate, the New York Times Book Review, the Times op-ed page, the Washington Post Magazine, San Francisco Chronicle, Forbes FYI, Good Housekeeping, Parents, Milwaukee Magazine and elsewhere.